Be One with the Food…. Yoga: physical, mental and spiritual practices to attain a state of permanent peace of mind in order to experience one’s true self. I started blogging a couple years ago due to a yoga-related mishap. Even though I am not a “bendy and flexy” person, when I do go to the occasional yoga class, I am able to breath and find some moments of inner peace. But I have found one form of yoga I could truly master…Food Yoga. Even just saying the term “food yoga” makes me think of food on so many different levels. I used this term recently with a client while describing the art of mindful eating. What would my definition of food yoga be? Food Yoga: To practice healthy, wholesome and soulful eating while being mindful of both your inner and outer surroundings. Think for a minute about our inner surroundings. Eating is an incredibly complex process that we often take for granted. It involves all five of our senses, all twelve of our cranial nerves, facial muscles, a complex swallowing mechanism so we don’t choke on our food…and that all happens before the food even reaches the stomach! Now think about our outer surroundings.What does the food look like? Sound like? Smell like? Can you see the different colours on your plate? Can you hear the crackle of breaking bread? The sizzle of steak on the BBQ? Smell the wonderful aroma….take it in before really taking it in. We have all or our senses activated before we even manage to actually eat what is in front of us. We take all of these food-steps for granted when we rush or eat mindlessly. We may not even notice other aspects of our surroundings…the ambiance, the company we keep, the conversations we may miss due to rushing. I am not saying we always have to be aware of every step, but practicing food yoga can help strengthen our relationship with food. 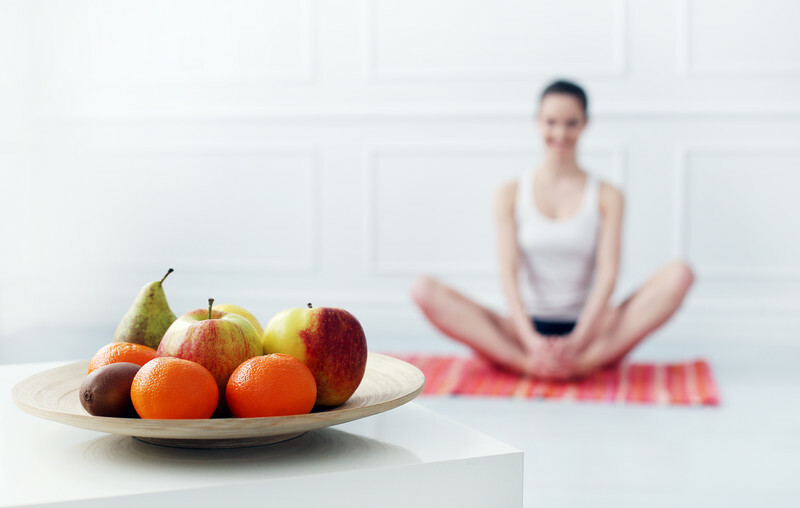 Ultimately, food yoga can enable us be mindful of what we are doing and focus on the enjoyment of eating and the afterglow of a good meal instead of rushing to the finish line. What’s that saying…it’s not the destination, but the journey? I know you may be thinking…”it’s just food…what is she going on (and on) about?” but eating is something we do on a daily basis. While we may not have time to practice food yoga everyday, maybe we should try sometimes to just take a moment during a meal….stop….close our eyes…and just…. breathe.